Play houses are lucrative long-lasting top sellers in the role-playing assortment. Whether it’s the supermarket, the ice cream shop, the hair salon, the restaurant, the animal clinic or the hospital – with our compact play houses made of wood, you’ll definitely be in the money when you have the right product for every customer’s wish! And whoever orders fast can really save: Use this chance to get to know our play houses with our 4+1 Play House Offer from 03.04. until 17.04.2019 – the Restaurant Play House (Product Nr. 10852) is free! 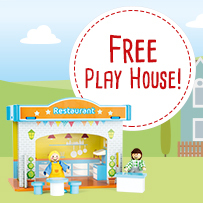 Pick out four play houses* of your choice in the time period between 03.04. and 17.04.2019, and we’ll give you the Restaurant Play House (Product Nr. 10852) for free. Simply enter the code FREE10852* in the promotional code box with your order in the shopping cart. ** The promotional code can only be redeemed once. Want to grab an overview? You’ll discover play houses and many more bestsellers online in our „Play Worlds“ product category!